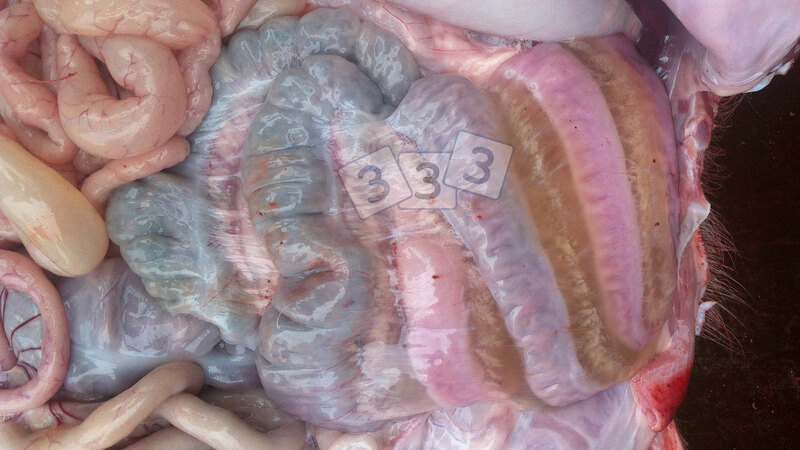 Oedema of the coiled colon in a weaner with oedema disease. This disease is caused by haemolytic Escherichia coli that produces F18 pili and Shiga toxin 2e (Stx2e, also known as verotoxin 2e or VT2e). Clinical signs range from peracute death with no signs of illness to CNS involvement with ataxia, paralysis, and recumbency. Oedema disease usually occurs 1–2 weeks after weaning and typically involves the healthiest animals in a group. The disease is seen occasionally in nursing pigs or in adult pigs. The average morbidity is 30%–40%, and the mortality among affected pigs is often as high as 90%. Periocular oedema, swelling of the forehead and submandibular regions, dyspnea, and anorexia are common. Some other typical post-mortem findings are oedema of the greater curvature of the stomach wall and coiled colon (as seen in this case).